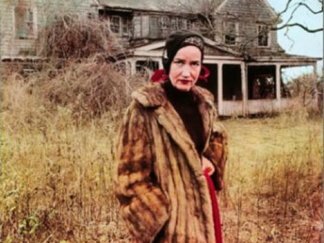 So what hasn’t already been said about Grey Gardens? In the years since its 1975 release, the film has influenced incredibly distant corners of American culture. For instance, it has somehow managed to earn a strong following among gay men, while simultaneously spawning a cult fashion following based on Little Edie’s sublime self-styled “costumes.” Grey Gardens tells a story that resonates so deeply that, in the last five years alone, it has been reconceived not once, but twice, in eponymous homage—first as a Broadway musical in 2006, and then as an narrative film based on the Beales’ lives that premiered on HBO last year. The film has the uncanny ability to improve on repeated viewings, and it proves hard to avoid inferring deeper meaning from some of the memorable lines dropped by the Beales. A favorite bit of dialogue arrives when Little Edie, in a moment of existential musing, shares with the camera, “It’s very difficult to keep the line between the past and the present. You know what I mean? It’s awfully difficult.” Similar difficulties are faced when attempting to encapsule this incredible example of the direct cinema movement. Following the screening, STF Artistic Director spoke with Albert Maysles and Muffie Meyer, who, along with David Maysles and Ellen Hovde, directed the film. Click “Read more” below for the Q&A. STF: What did you expect the reaction to this film would be? Today it’s an unusual film, in the 1970s it feels like it would have been an even more unusual film. STF: Muffie, I wanted to know what you expected of the film. Muffie: It didn’t surprise me in a certain way that there was controversy. The bitterness and vituperativeness of some of the critics was really surprising. And I think I expected, and it was also true, that part of the criticism came from the idea of exploitation of Jackie Kennedy Onassis’s relatives. And there was something about that connection that made people feel that we were trading on their aunt and cousin’s fame, that kind of thing. I don’t think I expected people to feel the sagging flesh problem and I didn’t expect people to really feel that Edie was crazy. I think she was, as Al said, completely eccentric, but clearly in control and dealing with things, and dealing with her mother. And I was surprised at how people used that as a way of not seeing what the film was really about, which was this really interesting relationship which to me was like a bigger version of many many kinds of dependency relationships that people have—with their spouses, with their friends, with their parents, with their kids, et cetera. Albert: What scared the critics and maybe even a small number of the audience here, is that they were so open. And for some people to be very open is a threatening kind of thing. But that’s the beauty and strength of their relationship and their character. That they would dare to be that open and take the chance of that kind of vulnerability. Muffie: One of the things I was surprised about was—I was pretty young when we made that film—was how when you showed people a film that you’d made about them, the people who let you into their lives and then you show them the film, they know themselves. They aren’t surprised by what they see, or shocked or even upset, and that was the case with the Beales. They felt that we had presented them as they were and they recognized themselves, and that’s been my experience with all the documentary subjects I’ve been involved with. Albert: I can tell you also that they were so mature and so levelheaded, that if Michael Moore had been filming them they would have thrown him the hell out of the house in a minute. They were that open because they trusted us. And having that kind of trust is a sure sign of sanity and maturity. STF: Al can you talk about your interaction with the Beales after the movie, years later? Albert: One moment that I remember so well is that two years later, when Mrs. Beale was dying, Edie was with her at that moment. And she turned to her mother and said, “Is there something more that you want to say?” And her mother turned to her and said, “There’s nothing more to say, it’s all in the film.” That gives one a great deal of satisfaction. Albert: I got many letters from her, and one of them, at the top she wrote, “Long overdue love letter.” And there was another letter where she wrote, Dearest Al, followed by 50 Dearest Als, and finally, a salutation at the end. Audience: How did you present the idea of the film when you first approached them? Albert: I don’t think there was anything to tell them, they were kind of waiting for it all of their lives., As Arthur Miller put it so well: finally, attention must be paid. Which is kind of weird because they’re recluses apparently running away from things, but when they had the opportunity to be trusted and to be liked as much as we liked them they sensed that immediately. I guess they saw it in our eyes, I don’t know what it was, but there was an immediate attraction which was maintained all the way through the film, and for many years after that. Muffie: They were also performers so they liked having an audience. STF: Muffie can you talk about piecing together the structure of this film in the edit room? Because it’s such a delicate subject. Muffie: It took us two years because, beyond being delicate, nothing happened in a way that yields a traditional structure in the way of a beginning, middle, denouement and end. I remember Susan and I used to ride our bikes over there in the summer—many summers—following the filming. And you’d come up to the house and you could hear them through the open windows because it was summer—singing, arguing—the same songs, the same arguments. So the piecing together took forever—and Albert and David were completely amazing in never saying, “Why’s this taking so long?”—was a matter of trying to figure out a way to create a change in the audience in the way that you feel about them. And it took a long time to figure that out. Interestingly, the last scene where they fight and Edie cries, which we call Pink Day, was one of the first scenes to be cut. And even though it didn’t happen toward the end of filming, we always knew that that was in some way a climactic scene, as much as we could get of one. So the rest of the film was kind of building and trying to get you to understand what was going on in a deep way. Albert: We had some particularly successful days in filming, and when those days occurred, they would usually say, “It’s been a banner day.” So they knew when things were right and when things were wrong. Audience: Were there any days during filming when you thought it would be a good idea to back off? At any point had you thought, maybe this is not a day to film? Albert: I can’t remember that, but that does happen, not all the time, but many times it happens in filming, and you better damn well back off when something is too personal. It requires a great deal of thoughtfulness and skill to have that kind of sensibility where you know when to film and when not to. Because there are many times, as in the scene that you mentioned where Edie was crying, there were many times when things aren’t that delicate where you have to make that decision. But it’s so important to get it when it’s proper to even if there’s a great deal of hurtfulness. It’s between those two extremes of being so careful that you miss something that they would like as well, and going in the other direction of exploiting them. Muffie: I’ll also say from watching all of the footage and listening to all of the wild sound, that the Beales tired the Maysles out just as much as the other way around. You guys would go off and rest in the car and David would leave the mic on the table that was between the two beds, and so we got a lot of discussion and a lot of sound. We even constructed some scenes around that wild sound that was gotten after the Beales had exhausted the Maysles. Albert: I have to insert a little promotion here. My daughters, Rebecca and Sarah, have come up with a book that was published called Grey Gardens. And at the very end of the book there’s a CD culled from over 100 hours of soundtrack where the camera wasn’t running, and it’s just wonderful, wonderful stuff. And also, more recently we thought there’s such wonderful stuff that didn’t make it into the film, and let’s make another film. And we did, it’s called The Beales of Grey Gardens. Both that film and this one are available from Criterion. Audience: I’ve never seen a film that brought forth the scent and smell so much. And I’ve always wanted to ask, how did that house smell? Albert: There was only one big obstacle, and that was the smell. Muffie: And the fleas, don’t forget the fleas. Albert: And the fleas. There’s a moment where [Little Edie] is talking to Jerry on the porch, and if you look closely, and if I were unkind enough to have done a close up on her legs, every single inch of Edie’s legs were covered with fleabites. When we would arrive at Grey Gardens we’d get out of the car and spray ourselves so we wouldn’t get bitten by the fleas. Muffie: I think you wore cat flea collars on your ankles and wrists. But one of the worst experiences I remember was getting offered food in there. It was really hard to eat. Albert: I’m not sure now, but we probably had a lot of cat food. Audience: I found it fascinating that they didn’t curse at all, unless that was cut out. And also they weren’t smokers, which was very common at that time. And I wanted to know if Jackie [Onassis] ever saw this, and what did she think if she did? Albert: I don’t know, did you hear of anything of what she may have said? Muffie: I heard that she snuck in incognito at one point when we were showing it in a theater, but she definitely communicated with them. And [the Beales] talked about how Onassis would sing with them on the phone. But she would also bring them clothes and give them some money, stuff like that. Albert: I remember my brother had a chance meeting with Jackie after the film, at an airport, and asked if she would see the film. And she said, oh I might sneak in. Which in a way, if you were a psychologist, it’s easy to interpret that. Both Jackie and we had a kind of strange relationship with them in that they loved them very much and were very close and very dear, but it’s a little difficult to make that public. Muffie: And as for cursing, I had never thought about that. They actually never did curse, but I think it was a class thing. I think it was in that era, in that class, where they just didn’t use any of those words. Albert: I get irritated every time I watch a film where there’s so much swearing, which doesn’t add a bit to it, especially if it’s a narrative film where it’s always under the control of the filmmakers. It’s disgusting. Audience: I was wondering what you thought about modern documentarians, modern documentaries. What you thought about filmmakers like Michael Moore. Albert: Well, Michael Moore—he’s off on his own track. I think his political philosophies I probably agree with one hundred percent, but his tactic of being out to get people I think makes his films that much less close to people. I can’t see him getting as close as he should with that kind of attitude. But he’s kind of an oddball that way, there are so many filmmakers who are getting close to people, and who are very successful at that. Muffie: I’m a huge film lover—both documentaries and feature films. And I’ve just been so impressed by the new crop of documentaries that have been coming out. I was just talking to someone yesterday about the relationship between documentaries and feature films, and among the many amazing things about documentaries are that unlike even the very, very best feature film, when you walk out of a documentary you wonder what’s happening to those people now, because they exist. So there’s a kind of mental afterlife that goes on in the audience where you think about the people and what’s going on. And often in Q&As you see that because will ask you what happened to her or what happened to him. And I think documentaries, because of the equipment being so cheap, there’s a kind of new flowering of possibility. We met someone last night who went off on her own to Iraq and made a film. And being a solo person wasn’t possible when Albert and I were starting out. Even though when Albert and I were starting out there was this huge change in equipment such that it was lighter and more portable and people began to do things that had never been done before. That kind of thing is happening in a new way, so it’s really cool. STF: We were talking before the film about other things happening in the Maysles Studios in the 1970s. You were very active making commercials, making other films. I was quite surprised to learn that there’s an entire film about Grand Funk Railroad that has never been released before. Muffie, can you talk about what it was like working at Maysles Studios in the 1970s? Muffie: I think that the company supported itself doing commercials. I think, a lot because of Gimme Shelter, there were several rock n’ roll films made. To me it was like this amazing place because it was so casual and friendly. Everybody worked hard but it was easygoing and everybody was like a family. I think that it probably continues to be that way. Albert: When you make a film like Grey Gardens or Salesman, you have a special devotion to the people in the film. They become your friends forever. I was asked recently if I had become unfriendly with anyone I had ever filmed, and I can’t remember that ever happening. And so many of them, I kept up to date with. Salesman—which was done 40 years ago—one of the salesmen visited me the other day, and two of them have passed away, but during their life there was constant communication. And part of that is because we treated them so well as subjects in the film.